Find artworks, auction results, sale prices and pictures of Frederick Henry Evans at auctions worldwide. 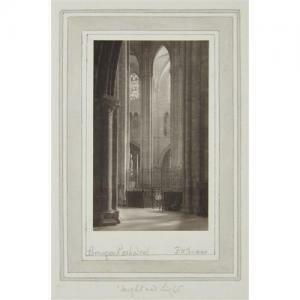 Frederick (1853) Evans (1853 - 1943) Lot 41: FREDERICK HENRY EVANS - Height and Light, Bourges Cathedral, 1906-1907 Dimensions: 5 1/8 x 3 1/8 in. (13 x 7.9 cm) Medium: Platinum print. Condition Report: Request to receive a Condition Report for this item or any items in this auction by contacting the seller. Literature: Newhall, Frederick Evans, cover Provenance: Collection of Evan Evans, the photographers son Witkin Gallery, New York Private Collection Sothebys, New York, 6 October 1999, lot 57 Robert Klein Gallery, Boston Notes: Signed and titled in pencil on the hand-ruled mount; signed and annotated 'Japine platinotype, Perfect print' in pencil on the verso. 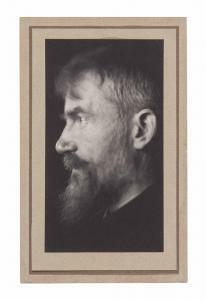 GEORGE BERNARD SHAW (1856–1950) and FREDERICK H. EVANS (1853–1943) A Self-Portrait, 1904 platinum print on layered mount, printed by Frederick H. Evans titled, dated and annotated 'Printed and mounted by F.H. Evans' by Evans in ink (tertiary mount, verso) image/sheet: 5 1/2 x 3 in. 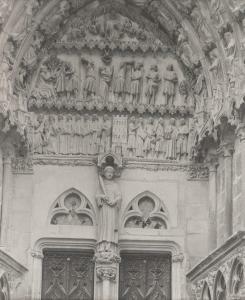 (14 x 7.6 cm.) primary mount: 6 1/8 x 3 3/4 in. (15.5 x 9.5 cm.) secondary mount: 6 3/8 x 3 7/8 in. (16.2 x 9.8 cm.) tertiary mount: 6 3/4 x 4 1/4 in. (17.1 x 10.8 cm.) Though rarely recognized for his photography, George Bernard Shaw was a prolific photographer for the majority of his life. After moving to London in his mid-twenties, Shaw's interest in the medium was established and he began authoring dozens of photography exhibition reviews and critical essays for journals. It was during this time in the late 1890s that Shaw met Frederick Evans, who was managing a bookshop that attracted various literary figures. Evans, well on his way to becoming an established photographer, was influential for Shaw and the two shared a love of photography, music, and literature for decades. They also photographed each other frequently. Shaw photographed constantly but was not comfortable as a printer. Evans often printed and mounted for him, as evidenced by the present half-portrait (Weston J. Naef, The Collection of Alfred Stieglitz, The Viking Press, New York, 1978, p. 435). Though seen in profile, the artist\’s famed fervor is palpable in his unwavering gaze. FREDERICK HENRY EVANS - Crépuscule au Printemps, before 1900 Dimensions: 5 1/4 x 3 1/2 in. 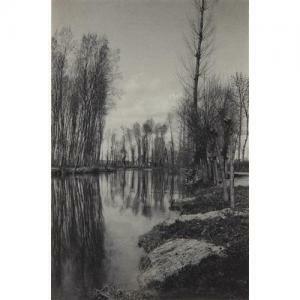 (13.3 x 8.9 cm) Platinum print. Literature: Apraxine, Photographs from the Collection of the Gilman Paper Company, pl. 125 Lange, Degrees of Stillness: Photographs from the Manfred Heiting Collection, Vol. I, p. 79 Haworth-Booth, The Golden Age of British Photography, 1839-1900, p. 180 Provenance: Lee Marks Fine Art, Shelbyville, Indiana, 1991 Notes: Titled in pencil and monogram blindstamp on the secondary mount. 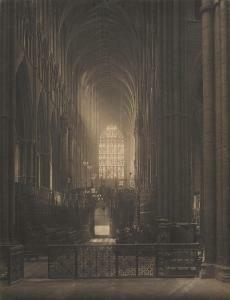 Frederick Henry Evans (1853-1943) Looking West from the High Altar, c. 1905 Platinum print, blindstamped monogram on the mount; titled in ink on a label and Evans' 'Ex libris' bookplate affixed on the secondary mount verso. 9 1/2 x 7 1/4in (24.2 x 18.3cm) primary mount 10 5/8 x 8in (26.8 x 20cm) secondary mount 20 1/2 x 12 3/4in (52 x 32.4cm) Footnotes Provenance With Witkin Gallery, New York, acquired 1972.